At almost twice the size of your average Las Vegas hotel room, The Venetian offers the largest standard suite on the Strip. The Venetian Resort Las Vegas is more than a hotel, it's a playground of your own design. The Venetian Las Vegas provides an opulent casino, full-service spa, and rooftop pool complex. 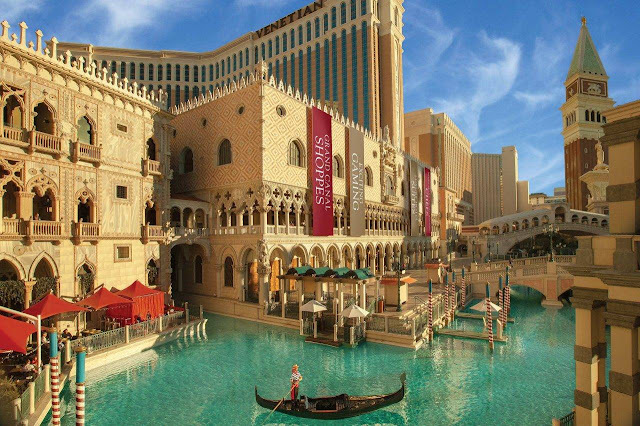 Guests can attend popular Vegas shows and ride a gondola along Grand Canal Shoppes. Guest suites at The Venetian offer sunken living rooms, Italian-marble baths, and 24-hour room service. Beds are dressed in Egyptian-cotton linens and white, goose-down duvets. High-speed wired and wireless Internet access is included in the resort fee. Accessible rooms are available on request.